Available in widths of 100–1600mm, and in 1-, 2-, 3-, 4-, 5- and 6-metre lengths, you’ll find the Code 3 lead to meet your needs at Ashbrook Roofing. Code 3 Lead Flashing is the thinnest and lightest of all roofing lead. Measuring just 1.32mm in thickness, it is typically used to create lead soakers on slate or tile roofs. Identified with a green label, Code 3 is only suitable for the lightest of applications. For lead flashing, valley gutters and cladding, we recommend using Code 4 and Code 5 lead instead. For further information on the correct use of lead, please give us a call on 01629 828500 to question our lead specialists! 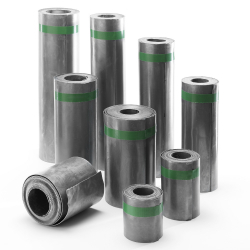 When you shop with Ashbrook Roofing, you are assured of quality, as all of our lead rolls are manufactured from milled lead to BS EN 12588. You’ll also find a quality selection of lead tools to ensure trouble-free installation. Place your order with us before 2pm and receive your order the very next day. Buy now!